Emile-Jacques Ruhlmann (1879-1933) is often referred to as the "Genius of Art Deco" and is generally recognized as the seminal French Art Deco designer of the 20th century. He designed furniture, wallpaper, rugs, and light fixtures. 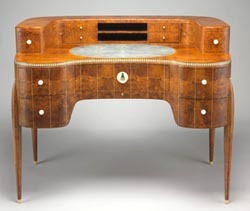 His furniture is distinguished by its delicate lines, rare woods, intricate ivory inlay, impeccable craftsmanship, and aesthetic refinement. Collectors today especially vie for Ruhlmann pieces made of macassar ebony, Brazilian rosewood, and amboyna burl. Ruhlmann would examine 1200 sheets of veneer from a piece of exotic wood out of which he may choose one for incorporation into his furniture designs. He was born in Paris into a family that owned a painting and home contracting company, so he grew up around woodworkers and craftsmen from whom he learned his trade and through whom he met talented designers and architects. When his father died in 1907, Ruhlmann assumed ownership of his family's business, taking it in new directions of the French Art Deco influence just emerging at the time and applying his design ideas first to the new Paris apartment he purchased with his new wife in 1910. In 1919, he expanded directly into the interior design business in partnership with popular French designer Pierre Laurent, and their designs for furniture, wallpaper, and accessories were instant hits with the Paris elite. Early designs trended more to the flowing Art Nouveau style which had been popular since the late 1800s, and he subsequently moved into heavier, more substantial designs that reflected the traits of the English Arts & Crafts movement. However, by 1920 he was completely consumed by the sensibilities and aesthetic values of French Art Deco. 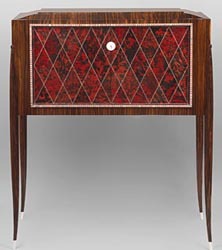 His use of rare and expensive woods was supplemented by the use of ivory highlights for inlays, handles, feel, and dentil work. Early production was contracted out to the best French cabinet shops, but in 1923 he opened his own manufacturing operation and by 1928 had expanded to 2 locations and included upholsterers, draftsmen, finishers, and over 30 master cabinetmakers. Ruhlmann's work was always designed for the wealthy and it remains so today, and he had somewhat of an elitist attitude but was realistic given the cost of the materials and time consuming craftsmanship he used in his designs. One very large and elaborate Ruhlmann piece reportedly took up to 1,000 hours of labor and cost the equivalent of a house. "A clientele of artists, intellectuals, and connoisseurs of modest means is very congenial, but they are not in a position to pay for all the research, the experimentation, the testing that is needed to develop a new design," Ruhlmann said in 1920. "Only the very rich can pay for what is new, and they alone can make it fashionable. Fashions don't start among the common people. Along with satisfying a desire for change, fashion's real purpose is to display wealth." Ruhlmann liked to design everything in an interior except the fine art. He made his name internationally at the 1925 Art Deco exposition in Paris, the Exposition Internationale des Arts Décoratifs et Industriels Modernes, where he designed the decor for several temporary pavillions. The most acclaimed was his Collector's House, a high-ceilinged building with a grand salon, a dining room, a boudoir, an office, a bedroom, and a bath. "I support my decorating business the way others sponsor a ballerina or horse stable," he once said. "Each piece of my furniture costs me an average of 20 to 25 percent more than I bill my clients. It is because I have faith in the future, and that I run another business with safe return, and whose profits fill up the holes that I am digging in the moon." His clients included Baron Henri de Rothschild, the Maharaja of Indore, the writer Coulette, the couturiere Madame Jeanne Paquin, Eugene Schueller (the French chemist who founded the cosmetics company L'Oreal), and Gabriel Voisin, the aviation pioneer and carmaker. In Ruhlmann's later years, he became interested in designing affordable furniture in solid, unadorned woods and industrial materials. The stock market crash of 1929 and ensuing worldwide Depression diminished the wealth and undermined the societal attitudes that had sustained Art Deco. He learned that he was terminally ill in 1933, and he mandated that only orders already in process were to be finished after which the company was to be closed. When he learned he was dying, he created a new system of inventory and sent every client a letter of authenticity for every piece he ever worked on- clearly thinking ahead. Scholars, collectors, and dealers owe gratitude to Ruhlmann, not only for his masterly, original, and elegant designs but also for the impeccable record keeping that allows us to verify them today. Buy period Art Deco pottery, glass, lamps, and more on the Collectics Art Deco & Art Nouveau and Fine Antiques pages, or search the entire site for great antiques, collectibles, and crafts for every collector!